Electronic cigarettes, until now generally believed to be less damaging to health than traditional cigarettes, produce dangerous ‘free radical’ molecules linked to smoking-related diseases such as cancer, a recent study claims. Scientists from the Pennsylvania State University claim that e-cigarettes - marketed as a healthier alternative to traditional smoking as well as a way for smokers to gradually kick their habit - actually pose a potentially significant threat to human health. Unlike traditional cigarettes, e-cigs deliver nicotine via aerosols or vapor – tiny liquid particles suspended in the air – and not by burning tobacco and producing smoke. Therefore, they are considered to be free from many dangerous substances associated with traditional smoking. Previous studies have shown that the vapor of e-cigarettes contains low levels of aldehydes - chemical compounds that are responsible for cell damage resulting from traditional smoking. However, no-one has paid attention to the ‘free radicals’ that can also potentially be produced by e-cigs – even though these are considered to be the primary reason for smoking-related cancer, cardiovascular disease and chronic obstructive pulmonary disease. "There's a perception that e-cigarettes are healthier than regular cigarettes, or at least not as harmful as regular cigarettes," said John P. Richie Jr., professor of public health sciences and pharmacology and one of the leading scientists of the research, according to the university’s press-release published on Wednesday. "While e-cigarette vapor does not contain many of the toxic substances that are known to be present in cigarette smoke, it's still important for us to figure out and to minimize the potential dangers that are associated with e-cigarettes,” he added, referring to the research group’s study focused on measuring free radicals in e-cigarette vapor. The study has shown that electronic cigarettes do produce considerable levels of highly reactive free radicals capable of causing cancer and other diseases as well as damaging cells, although these levels are still 1000 to 100 times lower than those produced by regular cigarettes, as the scientists claim in the paper published in the journal Chemical Research in Toxicology. 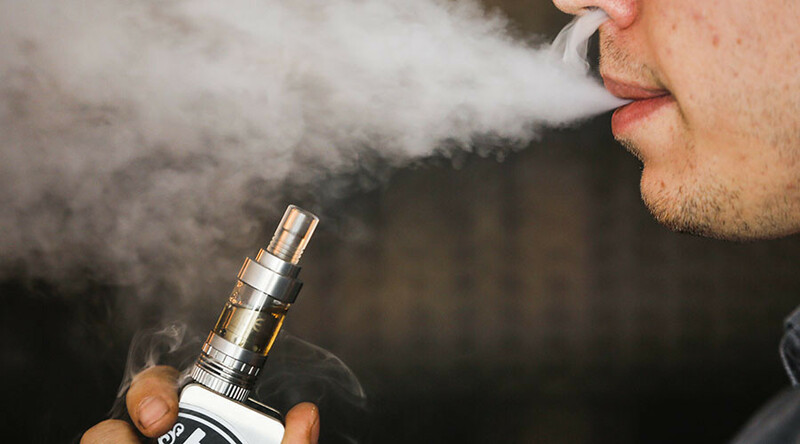 According to the study’s findings, the dangerous molecules are a result of the e-cigarette’s heating coil boiling the nicotine-containing liquid to very high temperatures. "This is the first study that demonstrates the fact that we have these highly reactive agents in e-cigarette aerosols," Richie said, as quoted in the Pennsylvania State University press release. "The levels of radicals that we're seeing are more than what you might get from a heavily air-polluted area but less than what you might find in cigarette smoke," he added. The research team is now continuing its studies, trying to precisely measure the total number of free radicals in e-cigarette vapor as well as to identify their chemical structures. "The identification of these radicals in the aerosols means that we can't just say e-cigarettes are safe because they don't contain tobacco. They are potentially harmful. Now we have to find out what the harmful effects are,” Richie commented on the ongoing research. In the meantime, e-cigarettes are gaining ever-growing popularity due to both their “healthier” image and relatively little info on the potential risks of their use. According to the Centers for Disease Control and Prevention in the US, more than 20 percent of young people as well as most current and recent former smokers have tried them.